Home » Proscribe vs. Prescribe: What’s the Difference? Have you ever been at a doctor’s office, and you were unsure whether your physician was recommending that you take a certain medication, or expressly forbidding you to do so? If you have ever found yourself in that situation, it is probably because your medical professional was not using language carefully. The words prescribe and proscribe are similar enough that many people get them confused, but they mean different things. Continue reading to find out whether you should choose proscribe or prescribe, and what you are conveying when you write these words. 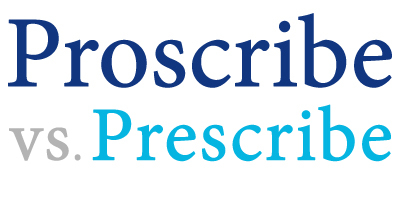 What is the Difference Between Proscribe and Prescribe? In this post, I will compare proscribe vs prescribe. I will use each word in a sentence to illustrate its proper meaning and context. Plus, I will explain a memory tool that you can use when you can’t remember the meanings of these two words. What does proscribe mean? Proscribe is a verb. To proscribe something is to forbid or prohibit that thing, often in a legal capacity. In a sense, it means the opposite of prescribe. Union rules proscribe speaking to a foreman without a representative present. It came to the boy’s parents to proscribe dangerous activities in the house. The laws of the land proscribed killing someone for no reason other than personal gain. What does prescribe mean? Prescribe is a also verb. It means to advocate for a clearly defined idea. In practice, it often means to authorize the use of medical treatment. Not all medical treatments require a doctor to prescribe them, but some do, especially those involving powerful drugs. The doctor prescribed Xanax for Gregory. To prescribe exercise as a cure for all ills may be both well-intentioned and short-sighted. Some people prescribe a set of unbreakable rules as the basis for a moral life. Here is a helpful trick to remember prescribe vs. proscribe. Both of these words are verbs. In a sense, they have opposite meanings: to prescribe something is to recommend it; to proscribe something is to forbid it. The way these words are spelled provide a reminder as to how they are used. Proscribe contains the letter O, just like the word no. When you proscribe something, you essentially say “no” to it. Likewise, prescribe has an E instead, which it shares with the word yes. You can use this mnemonic to remember the difference between these two words. Is it proscribed or prescribed? The words proscribe and prescribe are both verbs, but they have near opposite meanings. Proscribe is a synonym of forbid. Prescribe is a synonym of recommend. Even though these words are not homophones, they are close enough that they confuse many English speakers. Since proscribe is spelled with the letter O, like the word no, and prescribe is spelled with the letter E, like yes, it’s easy to remember when to use these words. Now you will know what your doctor means when he or she prescribes a medication for you. If your doctor proscribes some other activity, like eating fast food, you will know what lifestyle changes to make to better your health. Should you require additional help, or if you can’t remember whether to use prescribe or proscribe, you can always revisit this article later to refresh your memory. 1 What is the Difference Between Proscribe and Prescribe? Program vs. Programme: What’s the Difference?